Amsterdam attraction-guides.com - Amsterdam, Netherlands attractions guide featuring Amsterdam, North Holland Centraal Station / Central Station information, location, contact details, features and general Amsterdam, North Holland, Netherlands, NL Centraal Station / Central Station information. - Last updated 30/10/2012. 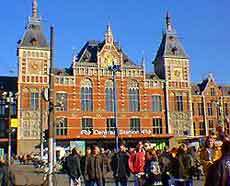 Centraal Station was designed by P. J. H. Cuypers, who also designed the renowned Rijksmuseum. This impressive red-bricked railway station was completed in 1889 and is situated in the heart of the city of Amsterdam. Nowadays most visitors to Amsterdam arrive at the Centraal Station, and with its imposing twin towers, this Dutch neo-Renaissance building is a very important transport hub, with buses and trams also terminating here and there is a general a buzz of excitement surrounding the area.